What can VADAAR LVC do for you? 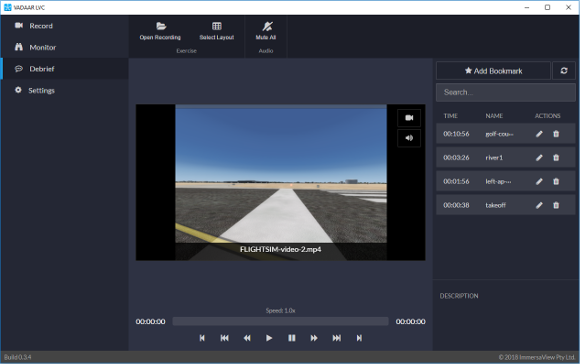 VADAAR LVC is an advanced connection framework that lets you record, monitor, and debrief in Live, Virtual, and Constructive environments. VADAAR LVC stands for (Video Audio Data After Action Review) (Live Virtual Constructive). VADAAR LVC can be added to any platform. Tap into video displays, cameras, audio, and network traffic to record everything that happens. You can record multiple exercises concurrently and in sync. Focus on every detail with built-in variable speed playback and frame stepping. Whether in the same room, same site, or distributed across the world. You can record Distributed Interactive Simulation (DIS) or any other UDP data, and synchronize this truth data with what the participant experienced. Compare what they thought they saw, heard, and did (perceived truth) with what was presented to them, how they reacted to it, and the truth data behind it all. VADAAR LVC can reconstruct the network environment so that you can work with your favorite simulation tools. VADAAR LVC leverages standards and builds on world class compression and streaming technology. Featuring support for any resolution and several codecs including H.264. This means that your debrief system will grow as you need it. Record to open standard mp4 files, including H.264 and display on 4K monitors. Need more capability? Add licenses at any time to expand. Support for screen resolutions 4K and above. Easily access all recorded video data, using open standard MP4 files. Instructors can add bookmarks to tag points of interest with notes for review during debrief. Bookmarks can also be automatically triggered based on events. Then, recall the bookmarks during playback for precision teaching moments. VADAAR LVC integrates seamlessly with other simulation tools and utilities, including radios, instructor stations, and image generators. Enhance your debrief further with sonomarc, providing radio frequency monitoring and the DIS PDU Analyzer (DPA), providing data analysis in an easily readable format for message Protocol Data Units (PDU)s.
When you purchase VADAAR LVC you become part of the team. We offer advanced support services whether you are a small or large customer. We’re with you at every stage of the process. Find out more about the VADAAR LVC features that enable you to stay in control as well as the low technical requirements you will need to welcome VADAAR LVC into your enterprise. Capture any UDP data, including DIS. Record to open standard mp4 files, including H.264 and display on 4K monitors. Runs on commercial off the shelf hardware. Integrate VADAAR LVC with PLEXSYS’s ASCOT, sonomarc, and DPA. 16 GB DDR4 (10 streams @ 1080p 30fps). 8 GB of available storage (without recordings). The total amount of storage required depends upon how much you record. Every hour of video and audio recorded at 2 Mbps requires 1 GB of storage space. As an example, 8 sources each 2 hours in length will require at least 16 GB of available storage. Intel i7-6xxx or above (10 streams @ 1080p 30fps). Note: On Windows 7, Aero is required for high performance capture. Intel i7-4xxx or above (5 streams @ 1080p 30fps).